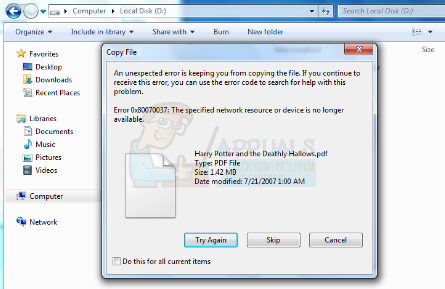 Sometimes, when users try to transfer files from the PC to their external hard drive, the file transfer stops and they may get error 0x80070037, which means that “The specified network resource or device is no longer available”. This could either be a power issue, an issue with the cable connected to the external hard drive, or even an issue with the USB port you are using to connect your drive to the computer. Let’s say you’ve been using your external hard drive for a while (although this can happen with recently bought hard drives as well), and just like any other day, you may have the need to transfer files from your PC or laptop to your drive. Then you get error 0x80070037, making you unable to transfer your files. You may try again, only to see the same error code. This may make you unable to transfer important files, or do anything else you might be trying to do with your hard drive. There are a few reported solutions of this problem, and it could even be an issue with your PC device, so please read on. This error might indicate that there is an issue with the USB 3.0 mechanism in your drive. To check this, you can try plugging it in a USB 2.0 port. If that was indeed the problem, you will be able to transfer your data, albeit much slower, at USB 2.0 speeds. You will easily differentiate the USB ports, as the 2.0 ports are usually black inside, and the USB 3.0 ports tend to be blue. This will require you to literally check every USB port on your PC, until you find a working one. USB ports tend to be connected in pairs, or in other words two by two – so there is usually no need to check a port next to another one which you know is not working. Take note of the ports you’ve checked so far and see if you can find a one that’s working properly and doesn’t give you the same error again. During the file transfer process, your hard drive could be disconnecting from the PC due to faulty or low quality USB cables. If possible, try and find another USB cable to connect your drive with and see if you can transfer your files now. If there is something wrong with your PC’s motherboard, you may try connecting your external drive to another computer. Then, try to do a similar file transfer to see if the drive will work properly with the newly connected PC. If it works properly, it means that there is something wrong with your computer’s motherboard which makes you unable to transfer files to your drive. If it still doesn’t work, it means that the problem is with the hard drive itself – it could be the power supply, or perhaps something else. However, these types of problems should be identified by Windows by using Method #1. In case your PC’s motherboard is bad, it could be causing issues with larger file transfers. This means that you would get a problem whenever you would try to transfer larger files to any device, not just your external hard drive. In order to identify if this is the problem, you can try and use a different external drive, if possible – and see if you can transfer the files to that one. If the files do transfer, it means that the problem is with the drive and not the motherboard, so at least there is nothing wrong with your PC. The problem with Error 0x80070037 is that there can even be more than one reason why you’re getting it. Since the problem can be with the external drive itself, the USB ports (motherboard) or the cables, it could also even happen (although not often) that two or more of these are faulty. In that case, it would be harder to identify the actual problem, but the methods we have listed above should definitely help!